I’ve always had a borderline obsession with post-apocalyptic fiction, even long before Cormac McCarthy’s The Road set the high watermark for the genre and made it a legitimate focus of literary interest. Before The Road, post-apocalyptic stories had always been relegated to allusive, dystopian fables like 1984, or a sub-genre of science fiction, the kind with cheap paperback covers featuring artwork depicting a low-rent knock off of Mad Max, which is what most post-apocalyptic stories were, and to an extent, still are. Although the sub-genre does have its own classics (The Stand, The Postman, On the Beach), none of them are regarded with quite the literary respect The Road has garnered. And while McCarthy’s book is well worthy of every line of praise it has received (indeed, it is one of my own favorite novels), it doesn’t do anything revolutionary in terms of structure or story. There are many PA novels that feature lone survivors or small groups of survivors, roaming the wastelands of a post-cataclysm society, searching for some small measure of hope or humanity with which to rebuild. The Road’s true enduring success is in McCarthy’s haunting, hypnotic prose, and the depth it lends to a seemingly simple story, a rare quality in a genre that often traffics in zombies, pseudo-mysticism, and leather-bound gangs of savages. While this entry is not ultimately about The Road, I focus on McCarthy’s novel because it seems impossible to have a discussion about any modern post-apocalyptic novel without at least acknowledging how McCarthy’s novel paved the way for it, and likely had at least some kind of inspiration in its creation. This seems particularly true for Justin Cronin’s The Passage, perhaps one of the most acclaimed PA novels since The Road’s release. In many ways, The Passage (even the title is similar), seems like a deliberate exercise in making a story with the tones and themes of The Road more digestible by a mass audience. It’s The Road, as written by, say, Michael Crichton. While that may make some people groan, the results are actually surprisingly satisfying, though it does take its time in getting there. A common praise given to The Passage, both from a quick perusal of online reviews and the book’s cover, are how well-written the book is. This feels like an effort on behalf of the publisher’s marketing department to cull the readers of The Road, who might otherwise be inclined to dismiss the book as cheap pop fiction. “Look, we can have an exciting, action-filled plot and good writing!” However, soon after starting the book, I began to believe this praise was highly dubious. The book begins pre-apocalyptic event, focusing on a handful of characters and events leading up to that event. While some of this material is interesting, much of it feels unnecessary and little of it can be classified as “well-written.” The dialog is bad, the characters are one-dimensional with vague motivations, and we spend an inordinate amount of time inside the heads of characters whom we don’t particularly care for, nor will we ever see again. 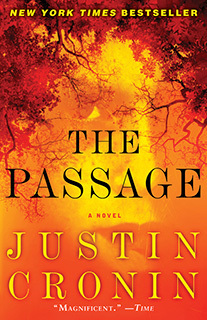 Several of the exchanges between the main character (at least early on), FBI Agent Brad Wolgast, and his partner, are particularly cringe-worthy for how cliché and just poorly conceived they are, and there are scenes that introduce elements that either have no closure (not by the end of this novel, which is the first of a trilogy) or are simply forgotten. Similarly, Wolgast’s relationship to Amy, the little girl at the center of the novel, is touching in some spots, but never fully convincing. Yet, in spite of these issues, there are enough occasional glimpses at a good story that it makes dismissing the novel difficult, it hangs on even when your instincts are to let it go. The quick pacing helps, for one, with scenes generally not overstaying their welcome, and there’s some legitimately interesting and creepy stuff surrounding the novel’s antagonists, known primarily as Virals, who resemble the sort of primordial monsters from I Am Legend, vampires of legend, who are the product of a government testing program on a group of death row inmates. There’s very little mystery as to whether these Virals will bring about the eventual cataclysm –we already know they will- but that’s not the point. If this portion of the novel has a saving grace, it’s that Cronin does effectively manage to build a world in its final days, much of the novel seeming to exist in a kind of perpetual, spooky twilight. Cronin uses the space to build atmosphere and emotional tension. It’s a sense of feeling we don’t see in too many PA novels, and while it does work well in spots, it also can’t completely overcome the problems I mentioned above. This also has the odd effect of creating the realization in the reader, somewhat early on, that we haven’t yet gotten to the “real” story, leading not to suspense so much as impatience. However, just as this impatience begins to really test the bounds of the reader’s patience, the novel takes a rather sudden jump and skips ahead almost 100 years into the future, and here, finally, begins the novel worthy of all the praise. The primary portion of the novel is concerned with an isolated colony of survivors in the California high desert, the result of a plan by the U.S. Government in its final days, to ensure the survival of the human race (many of whom have been turned into Virals by this point in the future). There is very little connection to the events in the first part of the novel. None of these new characters have any relation to the characters we are initially introduced to, nor do any of them have any real knowledge of the world as it was before the viral outbreak. Few of them even know what lies far beyond the colony’s protective walls or if there are survivors in the world other than themselves. The only real connection between the first portion of the novel and the second is the distant, but still lethal, presence of the Virals, who have only multiplied in the intervening century. It’s here that Cronin proves himself as a truly capable storyteller. While the pace never seems to slow all that much, Cronin still takes his time building this new world and populating it with genuinely interesting, dynamic characters and compelling conflicts. Where before I felt myself reading just to finish, here I began to really enjoy the story. Without the looming apocalypse on the horizon, the novel benefits from a newfound sense of freedom and imagination. Everything about this portion of the novel is better. The prose improves, the dialog is crisper, the conflicts are organic and compelling. The characters are interesting and memorable, and their relationships are more complex and dynamic. You come to care about them a great deal more than any of the characters from the first portion and you feel truly invested in their individual struggles. Further, set against the backdrop of the California desert, the story almost begins to resemble a classic western, like a John Ford film, building an epic tale of adventure and myth-making against vast mountain backdrops and blue sky vistas. This, at last, is the book we were promised. The main characters here are a group of younger colonists entrusted with the care and keeping of the colony. The colony is almost entirely self-contained and entrenched against attack from the Virals, but they soon discover the colony’s generators are almost at the end of their lifespan and there’s no way to replace them. This, of course, bodes ill, and is all the impetus required to set the story in gear. There’s also the matter of Amy, who appears suddenly and silently at the colony’s gates one night amidst an attempted viral attack, and who hasn’t aged a day in the 100 years or so since we last saw her. Needless to say, by the time the novel has ended, the colony will face several dangers, and every major character (at least those who survive) will have undergone some kind of significant emotional change. What’s also amazing is the way Cronin so effortlessly shifts from quiet interpersonal drama to spectacular action sequences without any of it seeming out place. Cronin also manages to increase the scope of the story by another several hundred years in a way that’s surprisingly fluid and doesn’t spoil the present goings-on. In short, it’s a whole lot of fun. In retrospect, part of me wonders if I really enjoyed The Passage this much, or if it just benefits from rising so far above the contrast of the novel’s early going slog. It also made me wonder why. Even after finishing, those first two hundred pages are puzzling to me. Even in hindsight, there seems no great benefit to the readers to know the precursor to the main story. There were many times, in fact, where I wished I didn’t know the details of the pre-apocalyptic world, as it would have added such a great sense of mystery and wonder to the already compelling story. This again feels like the heavy hand of the publisher wanting to appeal to a mass audience by giving them something they could more readily identify with by having the story start in the modern day. However, the same effect could have been achieved to greater effect had this section been divided into smaller, more select scenes and spread throughout the novel, perhaps as Amy’s flashbacks. It should also be noted that Cronin deserves high praise for making the rest of the book good enough to actually overcome this glaring flaw. As it is, I would advise anyone going into The Passage for the first time to skip the early section of the book altogether and only go back after you’ve finished the rest, if you’re so compelled. The trade paperback version of the novel weighs in at a hefty 766 pages, so you might be saving yourself both time and frustration. As a literary work, Cronin probably doesn’t belong in the same category as Cormac McCarthy, but then few do. Taken solely as an entry into the post-apocalyptic canon, however, The Passage is a worthy addition and deserving of its praise. Fun, engaging and memorable, this is popular fiction in its finest form. Tags: Justin Cronin, Kai Parker, Post Apocalyptic, review, The Backlog, The Passage, The Road, Virals. Bookmark the permalink. Previous post ← A Letter from the Editor: Chapbooks Available through Paypal and Amazon!